Serve salads, soups and sides in the Winco WWB-8 Woven Wood Round Salad Bowl 8" Perfect for cafes, bars, and other causal dining restaurants, wooden bowls have a quaint, wholesome appeal that makes your food presentation look healthy and inviting. 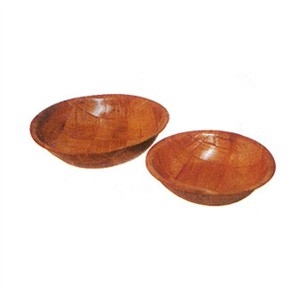 This 8" wooden bowl features a protective finish that enhances the look of the wood, while protecting it from chips, cracks and stains. It is also non-absorbent and dishwasher safe, making it perfect for commercial use.